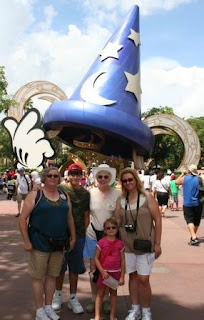 On Tuesday, we spent the last day of our Disney World vacation at Hollywood Studios! 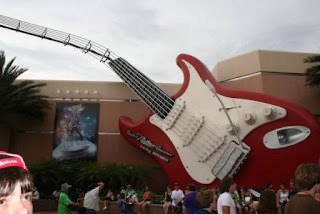 Disney has done a great job of spreading the "really cool" stuff around to the different parks. Once you're inside, you can't help but see the huge magician's hat! 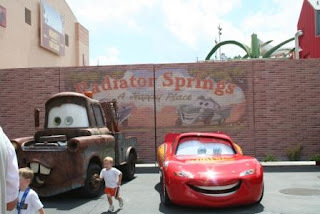 One of the main reasons I wanted to go to Hollywood Studios was to see Mater and McQueen! There was a long line for pictures, so I just stood off to the side and snapped a few shots. We also saw Buzz Lightyear and Woody, too. 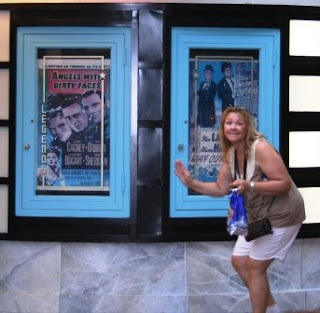 :-) We took the "Backlot Tour" which was worth the price of admission alone! Getting to see how things work 'behind-the-scenes' in a movie and from different sets added to the movie magic! After the tour, we looked through the movie props they had on display. Tyler got to pose with one of his all-time favorites! 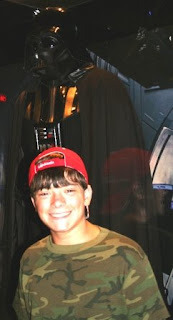 Later, Tyler, Mimi and I went on "Star Tours" which put us in the seat of a very cool Star Wars flight simulation!! We did grab a bite to eat during a break in the rainfall! They have "Fry Stands" where you can buy McDonald's fries - that's what Shan and the kids had. I got in a LONG line for a burger. The girl at the register commented on my Indians shirt and showed her my recently-SKINIT'ed phone with the Indians jersey on it. She said, "How bad is it that I can't wait to leave Orlando so I can go home and watch the Tribe play!?" LOL! Tyler was faced with the choice to go with me to ride Aerosmith's Rockin Roller Coaster or watch "Beauty and the Beast." He chose the coaster. We got in the singles line and before long, we were aboard - on different coasters. This coaster goes from 0-60 in about .5 seconds! As soon as my coaster took off, all I could think about was how mad Tyler was going to be at me for this! In the end, he enjoyed the ride, but said he kept his eyes closed tight for the whole trip. He had no idea who Aerosmith was. I, on the other hand, thought it was one of the best coasters I have been on in a long time! Loved the music, the smooth ride, the speed, the corkscrews, you name it!! Awesome! 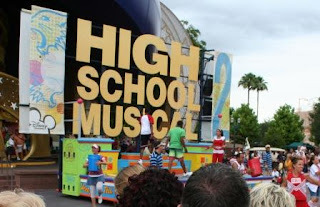 The rain stopped long enough for the "High School Musical 2" performance. Emily would not get out in front of the crowd and dance, but she enjoyed herself big time! By the time the last couple songs came up, we were all dancing and singing along! Great fun!! 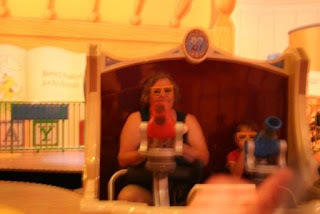 One of the best rides ever is the Toy Story Mania ride! This is a 3-d spinning arcade ride that features the characters from Toy Story!! We had so much fun pulling the string to launch virtual darts, toss rings, and even throw virtual confetti! I managed to snap a photo of Kay and Emily as they were coming to the end of the ride! 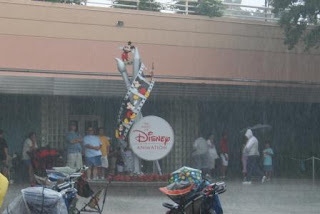 Even though the rain/storm closed down the outdoor shows we wanted to see, we still did a lot at Hollywood Studios. We saw several indoor shows, rode Pirates of the Caribbean and other rides, and did a lot of window-shopping (and, yes bought some stuff, too). 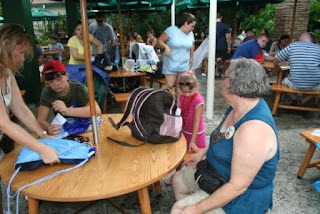 I did not go on the Tower of Terror mainly because the wait time was longer than I cared to stand in the rain. :-) The whole vacation was AWESOME! !